I joined the RSA some 20 years ago, when it became clear to me I needed some cross-‘business meets theory’ support above and beyond that which my professional sector of education was giving me. I needed the support of a couple of existing Fellows then to support my application, and apart from agreeing to subscribe some £250 a year, I was made a Fellow and I have stayed connected ever since. The Chief Exec. 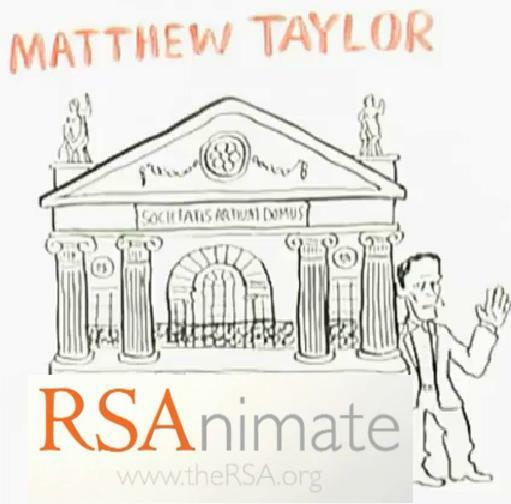 of the RSA, Matthew Taylor writes this in the Times Educational Supplement recently “It is important to develop skills that cross subjects and specialisms, skills that will be useful for all and in all walks of life” , and that’s certainly what my Fellowship has helped me gather, through its quarterly magazine, its events and projects. The RSA objectives include enabling the Fellowship to be a powerful force for social good and civic innovation, and that’s certainly part of my raison d’etre for engaging so widely and across the piece in education. I rather like Mr Taylor’s 21st animation that describes our current strapline of 21st Century enlightenment in some excellent thought-provoking and challenging ways – you can watch his talk here http://bit.ly/d1RFvF, brilliantly illustrated by the people from Cognitive media. I have already written about the humbling nature of Headship; what seemed so obvious in the first few years of running a school may remain just as clear, but the sheer scale of the complexity of human development means that the mission becomes really rather complex. To be able to step outside of my goldfish bowl, study, work and engage with others of greater experience, intellect and vision has been incredibly helpful. “Jamie’s Dream school TV on Wednesday nights has become part of my required viewing. Alvin Hall, the American financial trainer, hit close last week when he was prepared to accept that Jamie’s students were clever, but not that they were intelligent. We learn how to drive a car, a complex series of mechanical activities that bit by bit we make subconscious so that we can then pass a driving test, and then actually get into the whole process of transporting ourselves from A to B, and worry a lot more about other more important things. Learning is all about cognition, the result of perception, learning and reasoning, by which we acquire new skills or knowledge. Knowledge is an outcome of learning, it can be measured by tests; we learn the Highway Code as part of the driving test, we don’t actually have to understand what lies behind the code, and regular rehearsal will help us tick the right boxes. Superficial knowledge acquired this way becomes deeper as we become more experienced drivers, as we make more mistakes and learn from them, as we experience new conditions and control our responses as a result. Wisdom of the driver accumulates from many such sustained experiences, where knowledge meets common sense. “Never doubt that a small group of thoughtful, committed citizens can change the world. Indeed, it is the only thing that ever has”. Thank you James, this is great. I will share this with US Fellows – it’s a nice way to reaffirm how Fellows inspire each other and how the virtual coffee house is a place for collaborative learning. I invite you to visit the virtual American Coffee House for RSA Fellows at http://www.blog.rsa-us.org.